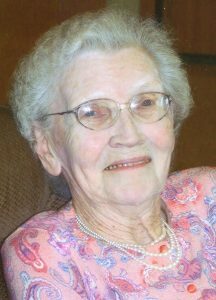 Anna S. Zaske, age 101, of Renville, formerly of Danube, died Saturday, March 9, 2019, at the RenVilla Nursing Home in Renville. Mass of Christian Burial will be held on Tuesday, March 19, 2019, at 11:00 a.m. at Holy Redeemer Catholic Church in Renville. The Rev. Joseph Steinbeisser will be the celebrant. Burial will be in the spring in the Zion Methodist Cemetery south of Danube. Visitation will be one hour prior the funeral Mass on Tuesday at the church in Renville. Arrangements are with Dirks-Blem Funeral Service, Renville, MN. In Lieu of flowers, the family asks for memorial contributions to Renville County Hospice for the care and comfort given to Ann. Anna S. Zaske was born on November 12, 1917, in River Falls, Wisconsin to Herman and Agnes (Winberg) Schoon. She later moved to Minnesota and was united in marriage to Donald Zaske on December 30, 1939, in Pine River, MN. They moved to Danube in 1942. Over the years, Ann worked in several cafés, factories, the Renville County Hospital, and later Renville County Human Services for 21 years. She retired at the age of 85. Ann also babysat for many years, and was known by many children as “Grandma Ann”. She enjoyed cooking, baking, knitting, crocheting, polka dancing, and a good game of cards. Survivors include her son Kevin (and Candy) of Redwood Falls, MN, her daughter-in-law Pat (and Larry) Klunder of Henderson, MN; her grandchildren: Mike, Scott, Tom, Kris, and Deidra; 8 great grandchildren, and other relatives and friends. She was preceded in death by her parents, her husband Don in 1981, her son Donald “Red” in 1979, and five siblings. A special thanks are given to the staff at Renville Health Services/Renville Nursing Home for the years of care given to Ann.